It is really important to make sure you defrost your freezer if it’s not frost-free. Every time you open your freezer door, warm air from the room will enter the chamber and eventually freeze and take the form of frost. You could nip this in the bud by never opening your freezer door, but that’s not a practical solution. We often get asked what the best way of defrosting a freezer is. The answer is, that depends. There’s a basic method you need to follow but you can also employ some household items to expedite the process. We’re going to run you through the standard method of defrosting your freezer first and then go into more detail about how you can speed up the process with different tactics and items. Before we go any further, it is recommended that you schedule in a time to do this. At the most, you are going to need a few hours to do this and your freezer needs to be empty in this time. The first step is to unplug your freezer. If you are defrosting a fridge freezer, your refrigerated food should be fine to stay in there as long as the door stays closed the entire time. Remove all drawers and trays. Place old towels or anything that will soak up moisture by the freezer. If your freezer has a drainage hose, run this into a bucket to collect the water. Prop your freezer door open if they close automatically and let nature run its course and melt the frost. Clean the drawers and trays thoroughly whilst you wait. Make sure the interior of your freezer as well as the trays and drawers are completely dry before putting them back and turning the freezer back on. They will immediately start creating frost again if they’re not. Put everything back where it was, turn your freezer back on and away you go. You will always have to follow that basic blueprint above, but instead of letting nature do the work in step 5 you can use the above tools to speed things up. Chip away at the ice with a spatula if there’s a particularly large build up, just be careful with how hard you chip. Another tool you can employ is a hot knife. If your spatula is metal, then you can heat this up too. Please exercise extreme caution if you choose to do this. If you heat up a knife or spatula this will help carve through the ice, just don’t burn yourself. A hairdryer will also melt all that ice pretty quickly. The obvious safety issue is using an electrical device around water. Please make sure that you take the correct steps to guarantee that the hairdryer does not come into contact with any water. For instance, putting the hairdryer inside the freezer and pointing it upwards for water to drip into it could cause serious problems. Just blow hot air into the freezer from outside it, try to avoid putting the hairdryer inside the unit. A household fan can help if it’s a particularly warm day. The fan will propel this warm air inside the freezer and will speed things up, admittedly not by a lot though. This method is good if you want to defrost your freezer whilst you’re out of the house for an hour or two rather than a day at work for example. Simply put it on, go and do your thing and it should have done the job in a couple hours. Another method that involves little hazard is leaving the trays in and putting bowls of boiling water on them. This will expedite the process a lot. If you do this, then close the freezer door whilst you do. This will keep the steam inside which will make light work of all that frost. And of course, the other method you can use is buying a frost-free freezer instead. 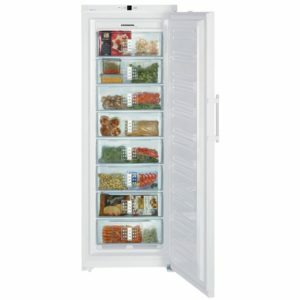 If you’re in the market for a new freezer, then shop our expansive range in our refrigeration section. 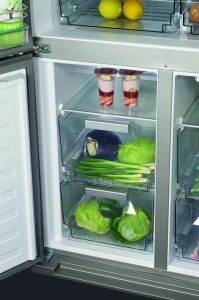 We have freezers from top, market-leading brands as well as fridges, fridge freezers and American-Style fridge freezers. With wide lines of cooking appliances, laundry units, cooker hoods and much more to shop, you can be sure to find a great deal on our website. Save money when you buy online today!